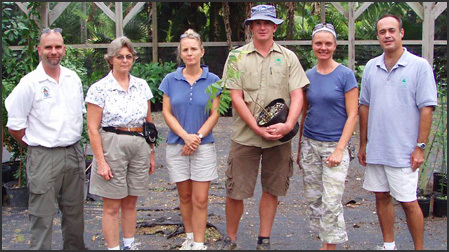 The Cayman Islands Native Tree Nursery was established at the Queen Elizabeth II Botanic Park in 2006. The objective of the nursery is to establish a reliable source of native trees and shrubs for private gardeners and commercial landscapers, to add some local flavor to standard landscaping design, and to improve the ecological value of developed areas. Seed collections have been ongoing for the past year, and some of the faster growing plants should start to become available for sale over the next year. Interest from developers has been immediate, with Chalmers Gibbs, landscaping architects for the new airport facility, amongst the first to request native stock for landscaping the new terminal development. Mark Stanley, landscape architects for the new schools buildings, are also investing in native landscaping. Their innovative plans incorporate dedicated Theme Gardens, which will showcase attractive local species of conservation interest and cultural significance. The Native Tree Nursery was established as a Darwin Partners project, thanks to a generous private donation from Maples and Caulder Partners, Henry Harford and Graham Lockington, with matched donations from the Queen Elizabeth II Botanic Park and the Department of Environment, and the support of the Shade brigade, CaymanNature, and Royal Botanic Gardens Kew.